Phone.com Review- Why So Many Business Chooses Them? Is the Phone.com VoIP Base Plan Right for You? If you’re interested in accessing a reasonably-priced virtual phone system for all your business calls, you should know that Phone.com offers a VoIP (Voice over Internet Protocol) Base Plan which retails for the low price of $9.99 per month. Here, I will help you to learn all about this popular VoIP provider about Phone.com! If you had no idea what VoIP is. No worry, I’ll just give you some glimpse of that and you can always read my VoIP for Beginner 101 here. We’re going to start things off by talking about what VoIP is (Really briefly). Then, we’ll discuss its primary advantages…and there are a lot of them! After this, we’ll discuss the features of the Base Plan from phone.com. Once you’ve read thru this review, you’ll find that knowing all of the facts make it easier for you to decide whether or not Phone.com is the right VoIP provider company for you! VoIP stands for Voice over Internet Protocol and it’s a bundle of technologies (as well as a methodology) for delivering multimedia sessions and voice communications via an IP network. Those who have Internet connections of reasonable quality are able to make and receive phone calls through their Web connections, rather than via their regional phone companies. When people choose to access Web-based phone service, they are choosing Voice over Internet Protocol (VoIP). This technology functions by converting sounds into voice communications which are digital. After the conversion, the digital voice communications are transferred via broadband Internet. These days, many people are making the decision to switch to VoIP. VoIP costs a lot less than typical phone service and this is probably the biggest selling point. In addition, calls of the long distance variety will be a lot cheaper than they would be if you didn’t utilize VoIP. As well, VoIP is really portable. Any time that you have access to a Web broadband connection, you’ll be able to log into your own VoIP account and hear a familiar dial tone! The third main benefit of VoIP is flexibility. You may use a typical phone and a converter for VoIP or a phone adapter for VoIP. The last primary benefit of VoIP is its multi-functionality. You’ll be able to make calls and also access other practical features, which are of particular value to those who wish to conduct business affairs via VoIP. For example, you may video conference, get voice mail and so much more. Every plan from every provider company is different, so you’ll need to find a VoIP plan which suits your needs. With this in mind, let’s talk about the Base Plan from VoIP! I certainly think that this Base Plan for VoIP is most suitable for entrepreneurs who are Sole Proprietors. 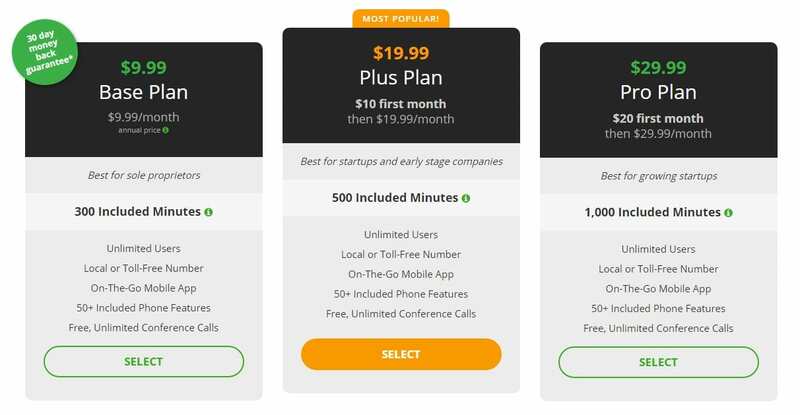 When you choose this affordable plan, which costs only $9.99 per month, you’ll get three hundred minutes of phone calls, for unlimited users. As well, you’ll be able to access a toll-free number or a local phone number. Another perk of selecting the Base Plan is that you’ll gain access to a mobile app which you may utilize while you’re out and about. As well, the Base Plan comes with a whopping 50 features. It’ll also allow you to make as many conference calls as you like, for free! When I tried this super-affordable VoIP Base Plan from Phone.com, I was amazed at just how many features I could access. These are standard features, so they’ll come with the Base Plan. 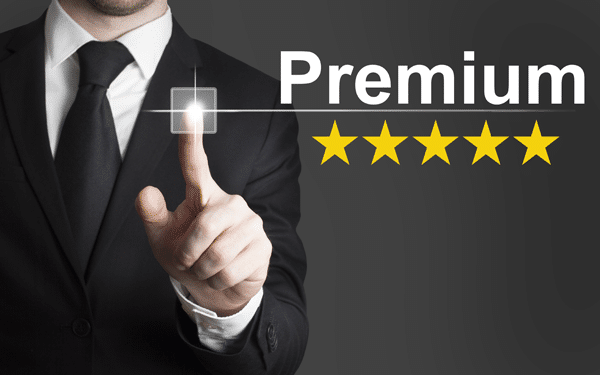 You won’t need to upgrade to a premium plan in order to use and enjoy them. Since I do business online as a sole proprietor, I appreciate these features. They allow me to take care of business in a more efficient manner. When you go for the Base Plan, you’ll access tons of amazing and sensible features which are offered with your ease and convenience in mind. For example, you’ll be able to access call screening, call waiting, an address book, instant setup, calling that’s international, audio conferencing, call blocking and a “click to call” communicator. This really just scratches the surface. Since there are fifty standard features, including text messaging, voicemail to email, a dial-by-name directory and caller ID (incoming and outgoing), you’ll find that you don’t have to give up the features that you’re used to when you switch to VoIP. The truth is that you’re likely to get a host of new features to play with, all of which will make it easier to operate your business. This is a LOT of features for fewer than ten bucks a month. The affordability of this plan is superb. When I compare this low subscription cost to how much I had to spend on phone service before I tried the Base Plan from Phone.com, I realize how much money I’m actually saving. Are There Any Drawbacks in Phone.com Review? Be aware that you’ll need a broadband Web connection in order to use this service. As we all know, Internet service, no matter how fast it is, sometimes it does go down. When your Internet connection goes down, you won’t be able to use the service, unless you go and find another Web connection with broadband features. Basically, if your office or home Web connection isn’t working, VoIP won’t work, either. However, this “con” certainly isn’t exclusive to Phone.com. It’s the same with every type of VoIP service from every provider. On the rare occasions that my Web service goes down, it’s usually back up before I know it. I don’t think I’ve ever had to wait more than half an hour for my Web service provider to fix its system and restore service to my home office. So, I don’t find that this “con” is a big deal. It’s never affected my ability to run my business. Also, the Base Plan doesn’t come with video conferencing. Lots of people want this feature and it is available from Phone.com, at a higher tier of service, for a bit more money per month. So, it’s definitely not out of reach from this respected and established VoIP provider company! Do You Need Premium Service? If you want more from phone.com, you should know that the Base Plan isn’t the only option. It’s possible to upgrade to Premium service if you wish to. When you do, you’ll open up more features, including caller analytics, call recording, video conferencing, voicemail transcription and CRM integration (to name just several). If you’re someone who will benefit from video conferencing, you should consider the higher tier of service. It won’t cost much more. There are trios of VoIP service plans available from Phone.com. The cheapest is the Base Plan, which we’ve spend a lot of time talking about today. The next tier of service is the Plus Plan, which costs $19.99 per month and the highest tier of service is the Pro Plan, which costs $29.99 per month. The pricier the plan, the more monthly minutes you’ll get. Also, you’ll access more features with the mid-range and high-end plans. If you check out their website, you will see the most popular plan is the Plus Plan. However, the Base Plan is definitely more appealing to me because it does offer a lot of minutes and features galore, for a rock-bottom price tag. If you’re in business alone, you may find that the Base Plan offers enough VoIP support. It’s really designed with the needs of sole proprietors in mind. As well, it comes from a provider company that I trust. Phone.com has a positive business reputation, it’s been around for a while now and most reviews by customers are in the very good to excellent category. In the digital age, there’s just no reason to overpay for old-fashioned telephone service. There is a better way. With VoIP from Phone.com, you’ll spend less than ten bucks per month for all of the features that you want and deserve (except video teleconferencing). Designed to help sole proprietors lower their overhead cost, the Base Plan is the key to trimming monthly expenses and turning a bigger profit. Since you’re probably using your computer and smart phone a lot during the day, why not take phone calls from your electronic hardware? It’s so much more cost-effective and convenient than typical, non-VoIP phone service. I also like the fact that this plan comes with a money back guarantee that lasts thirty days. It’s nice to have recourse as a consumer, just in case, and some provider companies don’t offer this type of guarantee. Should You Try Phone.com VoIP Today? Most probably not today. I always encourage you all to check out more options and make comparison before jumping into conclusion. However, you certainly deserve a cheap phone service via your own broadband Internet connection. When you choose Phone.com’s Base Plan, you’ll get so much for your money. While this plan might not be appropriate for a company which have more workers, it’s definitely ideal for entrepreneurs who run their businesses on their own. To find out more about the Base Plan, please visit the official Phone.com website today. When you do, you’ll be able to compare the three tiers of service and then determine which one is best for your requirements, preferences and budget. After you sign up, you’ll find that getting started with ultra-modern VoIP is as easy as 1,2,3. This company has great customer and tech support, so help will always be there when you need it. Why Not Get The Extra 15% Discount Here on Your Entire Bill.